A mixed bag of fishing reports for Sooke this week. People are still chasing halibut with some luck west of Sooke and off Victoria. Salmon fishing remains steady, with a fair number of feeder springs (up to 8 lbs) and the occasional large hatchery spring to keep things interesting. The regulations remain uncertain, in terms of when the slot limit will be removed (can only keep wild salmon 45-67 cm in length). 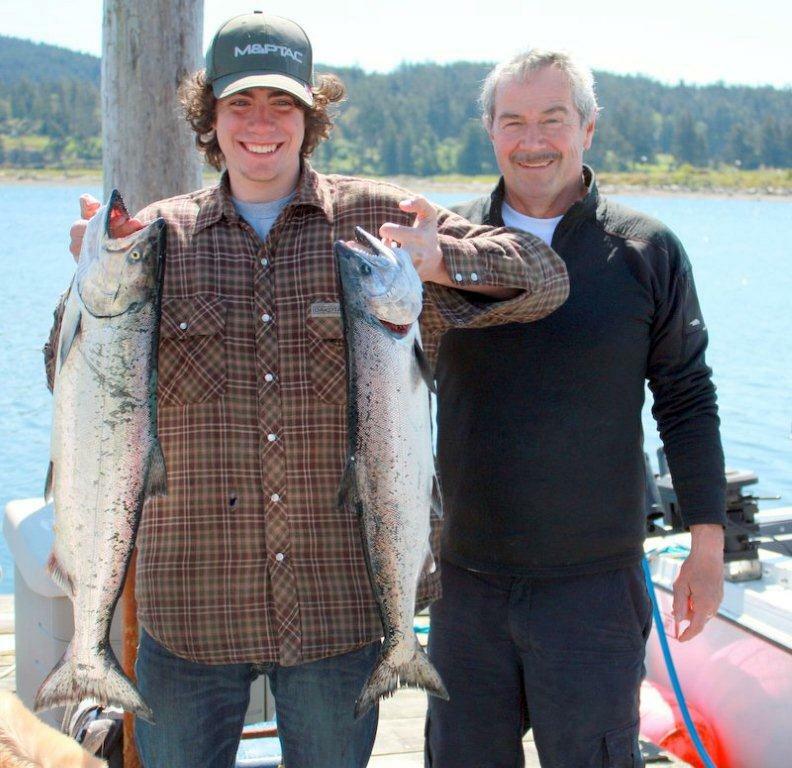 Here's Hazen Price and the 2 chinooks he caught last week off Sooke Harbour with his grandfather Mark. The crabbing is reported to be quite good in Sooke Harbour. So...there's some fish being caught, worth dropping a line for sure. The Sooke Salmon Enhancement Society had a work party last weekend to clip coho salmon. By clipping off the adipose fin, they are marked as hatchery fish -- which hopefully means more fish to be caught in 3 or 4 Falls from now. The SSES motto is "we hatch 'em, you catch 'em". Their work is very much appreciated! And they are always looking for support, be in financial contributions or volunteering time.